1. 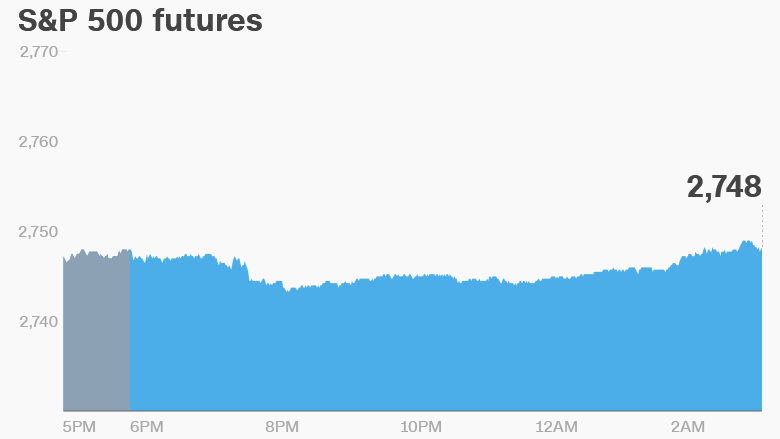 Can't stop, won't stop: U.S. stock futures are pointing up again after a string of record-setting days. Volatility levels remain low and investors seem unconcerned about the potential for a market correction. European markets are rising in early trading following a strong day in Asia. Investors have been cheering official talks between North Korea and South Korea. "The question is whether this should be interpreted as the beginning of a decrease in tensions or as way for North Korea to try to push South Korea and the U.S. apart," said Andreas Johnson, an economist at Swedish bank SEB. "However, equity markets seem to go for the former interpretation." 2. Samsung stock slide: Shares in Samsung (SSNLF) slipped on Tuesday as investors were underwhelmed by the company's profit estimate for the final quarter of 2017. The company's sales and profits are expected to rise significantly, but the numbers didn't meet investors' high expectations. 3. CES rolls on: The annual Consumer Electronics Show -- better known as CES -- is officially under way in Las Vegas and runs through Friday. On Monday, Intel (INTC) CEO Brian Krzanich gave a keynote address where he said the tech industry has done a "remarkable" job responding to the embarrassing computer chip flaws that caused alarm around the world. Krzanich thanked other firms for their efforts to protect customers following the disclosure of the Spectre and Meltdown vulnerabilities in processing chips, which could allow hackers to steal data. But he didn't offer an apology or an explanation for why Intel and other leading chipmakers failed to spot the problems for decades. Apple (AAPL) on Monday released new security updates for iPhones, iPads, and Macs to protect users from Spectre. 4. Cellphone intrigue: AT&T (T) and Chinese smartphone maker Huawei may have had a falling out, according to a report in The Wall Street Journal. It reported that AT&T just walked away from a deal to sell Huawei phones in the U.S. The U.S. market has proven to be a tough one for Huawei to crack after Congress issued a critical report in 2012. Lawmakers suggested that Huawei equipment could pose a threat to national security -- allegations that the Chinese company described as "baseless."